The oats and yogurt in this smoothie are a powerful combo, providing protein and fiber to fuel your morning. And, with just enough sweetness from strawberries and banana, this is one satisfying smoothie that is sure to keep hunger at bay! 1. Place oats and milk in a jar. Stir and cover. Store in the refrigerator overnight or until the liquid is absorbed and the oats are soft. 1. 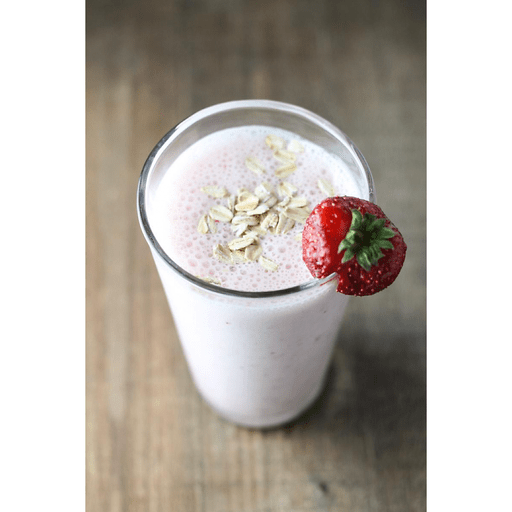 In a blender, blend softened oatmeal, banana, strawberries, yogurt and ice cubes until smooth. Serve. Calories 220, Total Fat 2g (Saturated 0g, Trans 0g), Cholesterol 5mg, Sodium 90mg, Total Carbohydrate 43g (Dietary Fiber 4g, Sugars 21g), Protein 10g, Vitamin A 10%, Vitamin C 20%, Calcium 25%, Iron 6% *Nutritional values are an approximation. Actual nutritional values may vary due to preparation techniques, variations related to suppliers, regional and seasonal differences, or rounding.